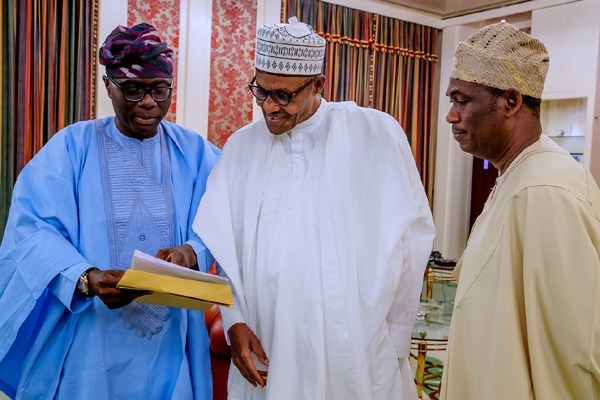 ABUJA – PRESIDENT Muhammadu Buhari Monday met behind closed doors with the Lagos State Governor-elect, Babajide Sanwolu, and the deputy governor-elect at the Presidential Villa, Abuja. This is as the governor-elect has decried the incessant building collapse in the state and said that Lagos requires regeneration. He also said that the incoming administration under his leadership has many good packages for the Lagos people. According to him, “We are actually very excited. We are excited because we’ve seen all the challenges ahead of us and we know that given all of our strategies on the campaign trail, that we will certainly be bringing about solutions that will solve various challenges in Lagos very quickly. On the recurrent collapse buildings in Lagos, he said, “It’s an unfortunate incident, even when I was in government before, I used to be the Vice Chairman on Building Collapse. It was something that was about ten years ago which is what led to us creating an agency called LABCA after it was meant to begin to identify structures well ahead before issues like this begin to happen. “But it’s an unfortunate thing, extremely very unfortunate and it also means that we expect it would happen again. So imagine the current government have started very quickly the integrity testing of the properties in the state. “You know Lagos is a part of the old colony of Lagos, so it’s not unexpected to see houses that are over a century old and in those numbers, we need to be sincere to ourselves and we need to be real. Also commenting on urban renewal that has become a problem to the city, the governor-elect said it was not really a challenge, but because the state has not been able to see it through to the end. He said, “When you want to take people’s properties and you want to regenerate, they must first see a sincerity of purpose – what are the additional plans that you have for them? “Before you could regenerate, there must be a stop gap – in the next two to three years what are the plans you have for them? And you need to do what we call proper enumeration. Once you can enumerate properly and determine who are the original owners, and you sit and have an agreement, then the regeneration will start. “You can do it in two ways: It could be in form of which when you come back, you have part of it; or you turn it into equity. So it depends on whatever model you are working round to ensure that it works. Next articleTrump keeps publicly shaming companies. Does it work?